, A Chameleon’s Grace, 2018, dye, ink, oil, graphite on sewn canvas, 60 x 68 inches, $9500. David Konigsberg, Lone Cumulus, 2018, oil on panel, 23 x 24 inches, $3800. 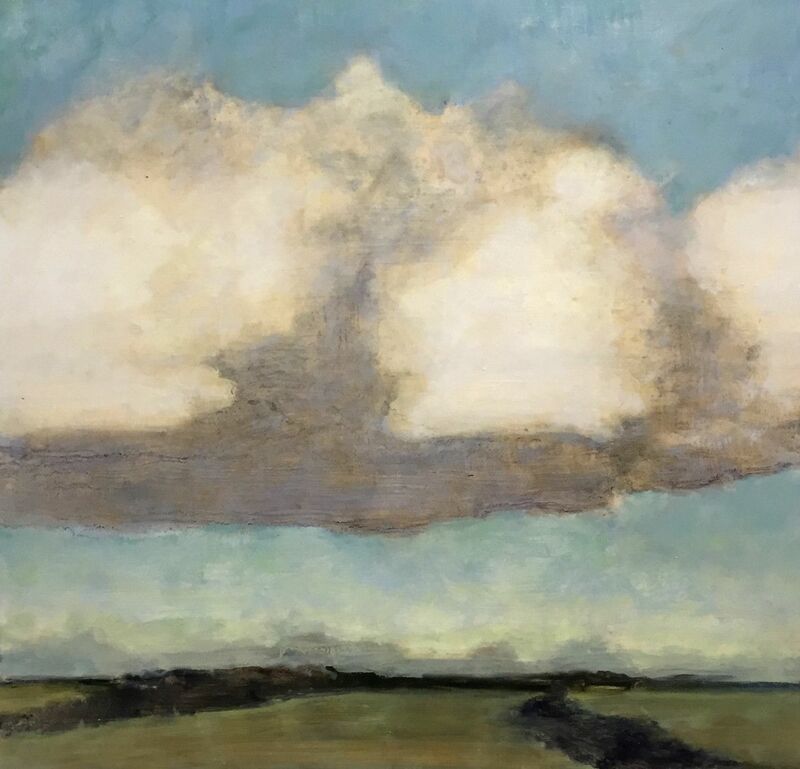 Kenise Barnes Fine Art is pleased to open the fall exhibition season with a group show featuring three artists for whom nature is a primary inspiration. The timelessness of nature with its mesmerizing rhythm endures as a balm for the soul and a meditation on life and creativity. Each gesture of beauty and sweep of rich color in these painters’ canvases feeds the eye and beckons to the imagination. This same muse moves each artist in very different ways and with idiosyncratic and beautiful manifestations. Nancy Daubenspeck lives in a solitary valley by a river; nature is ever-present for the artist, permeating her life and work. Byzantine iconography, renaissance fresco, poetry, and calligraphy are also inspirations for the artist’s spellbinding paintings. Daubenspeck works with numerous, extremely thin veils of color and brushstrokes in the Venetian style. Her paint is hand mixed dry pigment in casein (the main protein found in milk) emulsion brushed on muslin stretched over wooden panel. The paintings are meditative and intimate. The painted surface is dry and luminous and rich in physicality, very much like fresco. 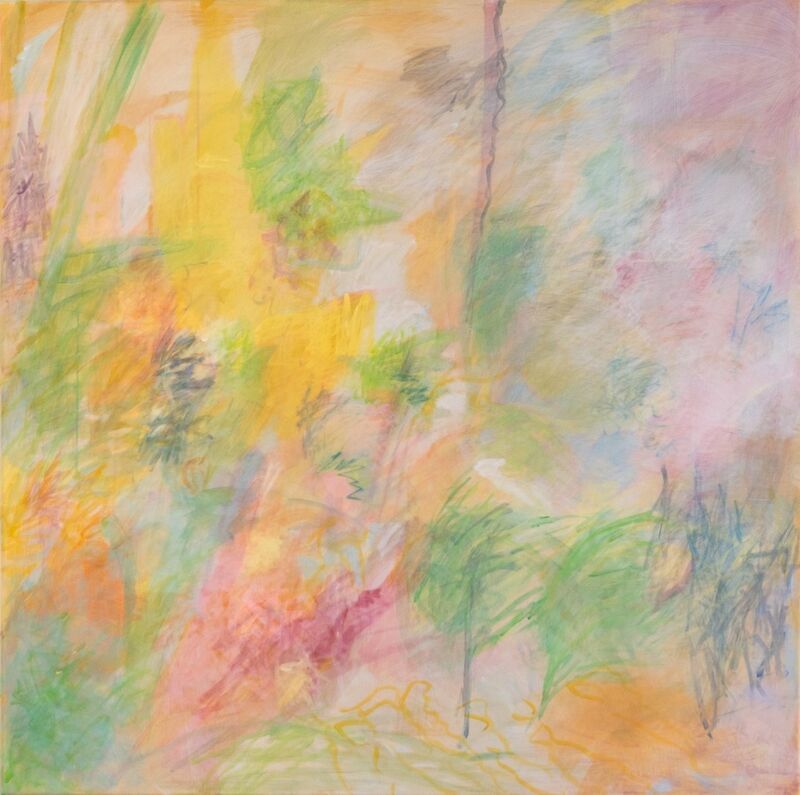 Her work is about paint and light, how illumination defines and harnesses color, pattern, and form. Daubenspeck’s process is a continual rebalancing of the vibrant glazed layers and marks, the opaque veil, and the geometric composition of the calligraphic brushwork. It is these juxtapositions that are the most provocative aspect of the work. This is Nancy Daubenspeck’s first exhibition with the gallery. Daubenspeck’s formal education is in chemistry, mathematics, and computer science. She has done research in inorganic chemistry, physics and seismology. She has training in iconography and lacemaking and began painting in earnest in 2006 after an introduction to casein and panel painting at Parsons School of Design, New York, NY. The gallery is thrilled to debut the work of Dana James. James’s paintings channel the essence of sound waves, water, and natural light. Inherent in the artist’s evocation of water and land is the implication of “drift”, the state of floating between catharsis and danger, between peace and abandonment, and between fear and diving in. James’s paintings exhibit an exquisite sense of touch. 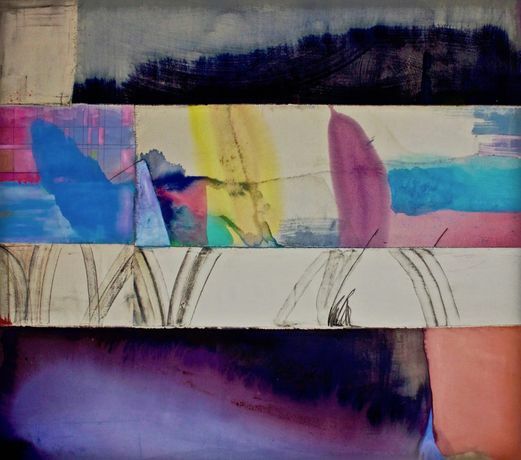 She employs multiple mediums and textures by pouring paint and employing a variety of mark-making techniques; the artist builds meaning and interest through this layering and sometimes by combining canvases and ideas with sewing. Continually investigating and pushing the boundaries between abstraction and representation, James draws on wide-ranging existential themes while referencing the great American tradition of Color Field Painting with stunning originality. Dana James earned her BFA from School of Visual Arts, New York, NY. 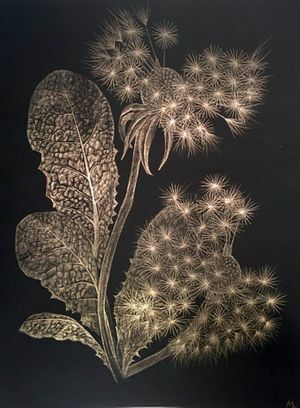 Her work has been exhibited extensively in New York and throughout the United States. Her work can be found in private and public collections including the ISLIP Museum of Art, Islip, NY and the Collection of Lion Tree Capital in New York, NY. She has been featured in publications such as Art Critical, ArtSpace, and Hyperallergic. Dana James is a New York native currently living and working in Bushwick, Brooklyn. David Konigsberg’s new work focuses on the most visceral places where nature and humanity meet, conflict, and accommodate one another. As always, Konigsberg’s paintings bridge the divide between art and real life in semi-narrative paintings that are both objective and conceptual. His work occupies a netherworld of image and memory in his very personal narratives, which are not meant to be deciphered but experienced as emotional possibilities. This is the artist’s tenth exhibition with Kenise Barnes Fine Art. The artist’s work has been exhibited throughout the United States and has been featured in the The New York Times, Chronogram, Wall Street International, and Brooklyn Journal as well as numerous art and culture blogs. David Konigsberg lives and works in Hudson, New York. · Complimentary in-home or in-office consultations. · Artwork may be seen on a three day on-approval basis.